That passing glance – sounding paths between memory and familiarity in The Routledge Companion to Sounding Art, Marcel Cobussen, Vincent Meelberg and Barry Truax, eds, Routledge, 2017. Some questions around listening: Vancouver Soundscape Revisited by Claude Schryer in Expanding the horizon of electroacoustic music analysis, Simon Emmerson and Leigh Landy, eds, Cambridge University Press, 2016, 376-299. Listening at Home in Affective Landscapes in Literature, Art and Everyday Life, Christine Berberich, Neil Campbell and Robert Hudson, eds, Routledge (previously by Ashgate), 2015, 207–221. The concept of Acoustic Ecology [pending] — keynote speech for Symposium on Acoustic Ecology, Kent University, November 2013. Listening together, making place, Organised Sound 17/3, Cambridge University Press, 2012. Guest editor/curator, two themed issues of Organised Sound (CUP), on ‘Sound, Listening and Place’ (read editorials for 16/3 and 17/3, 2011-12). The Listening Workshop, an essay written in response to attending the World Forum for Acoustic Ecology conference in Corfu, 2011. Published inSoundscape, the journal of the WFAE. Beating the bounds for ordinary listening, keynote presentation, World Forum for Acoustic Ecology conference, Corfu, 2011. Conkers (listening out for organised experience), in Organised Sound, 15, pp 116-124 doi:10.1017/S1355771810000105. 2010. Listening Change , a panel presentation for ArtMusFair 2010, Fryderyk Chopin Conservatory, Warsaw. October 2010. A Wave Across the Auditorium, an experimental essay on sound, art and space for a book accompanying Absorption and Resonance, an exhibition of Sound Art in Norway (2009). Local Materials (there’s my stop), an essay on my works with voices, words and sound. Also published in Playing with Words ed. Cathy Lane (CRiSAP/RGAP/Cornerhouse, 2008). Where are We Listening, and What are We Listening To?, a keynote address: EMS07 (Electroacoustic Music Studies 07), De Montfort University, London. 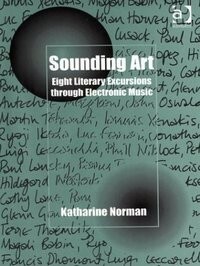 (book) Sounding Art: Eight Literary Excursions through Electronic Music, Aldershot, UK and Vermont, USA: Ashgate, 2004. Stepping outside for a moment: narrative space in two works for sound alone, book chapter, in Music, electronic media and culture, ed. Simon Emmerson. Aldershot, UK and Vermont, USA: Ashgate, 2000. Real-world Music as Composed Listening in A Poetry of Reality: Composing with Recorded Sound Contemporary Music Review, vol 15 Parts 1-2, ISBN 3-7186-5932-8 (1996), Taylor and Francis, issue editor Katharine Norman – now available on Kindle! Telling Tales, in Timbre Composition in Electroacoustic Music. Contemporary Music Review vol. 10, Part 2 pp 103-9. London: Taylor and Francis, 1994. “Canadian Music and Performing Arts,” encyclopedia entry for The World and its Peoples (Brown Reference Group). “Classical Music and Opera,” extended entry in USA 1950s, encyclopedia series (Brown Reference Group, 2005). “Columbia-Princeton Electronic Music Studio,” in the New Grove Dictionary of Music and Musicians, second edition, ed. Stanley Sadie. London: Macmillan, and New York: Grove, 2001. “Electronic Music,” extended entry in Encarta Encyclopedia (1995– ), World-English Edition (Microsoft CD-ROM). Realworld Music (Ph.D. dissertation, Princeton 1993) Summary – The dissertation explores the aesthetic, philosophical and listening implications of a documentary approach to tape music composition. I see this approach as fundamentally different from that of classical musique concrète. The first chapter suggests ‘categories’ for the way we may listen creatively in real life, and transfer these stances to musical listening. Subsequent chapters draw on comparisons and analogies from oral storytelling traditions, Eisensteinian film theory and modern poetic thought. I discuss a variety of pieces by composers such as Risset, Ferrari, Lansky and Lucier, and also some of my own compositions. NB a revised version of some of this dissertation is published in A Poetry of Reality: Composing with Recorded Sound (see above).